Have you noticed how many people are grumpy at Christmas? Running around like maniacs, tapping their feet impatiently in queues and generally looking fit to bust a gasket. All the lying around on couches eating bon bons that I have been doing lately has put me in quite the zen mood so you can imagine that when I hit the shops yesterday I was a little befuddled by all the angst in the air. Glum faces, elbows held close to sides to ensure a more aerodynamic movement through the bustling crowds, people being cranky and rude to sales assistants. What’s going on, people? I wanted to shout. It’s supposed to be the time of peace and goodwill to all men. The shopping centre I frequent, The Broadway Centre, is situated right next to one of my favourite parks in Sydney, Victoria Park. When I was nearly knocked flat on my face by a red-faced man carrying an enormous plush elephant, then almost stabbed through the heart by a girl carrying two gigantic candlesticks, (Tottering, she was actually tottering and the candlesticks looked ready to fly out of her hands at any moment. I thought she was one of those street performers travelling incognito who couldn’t help but break into her juggling routine wherever she went….) I decided it was time to remove myself from the snarling, ravenous Christmas hordes. So I went to Victoria Park. Aaah, the sweet sights and sounds of the park. 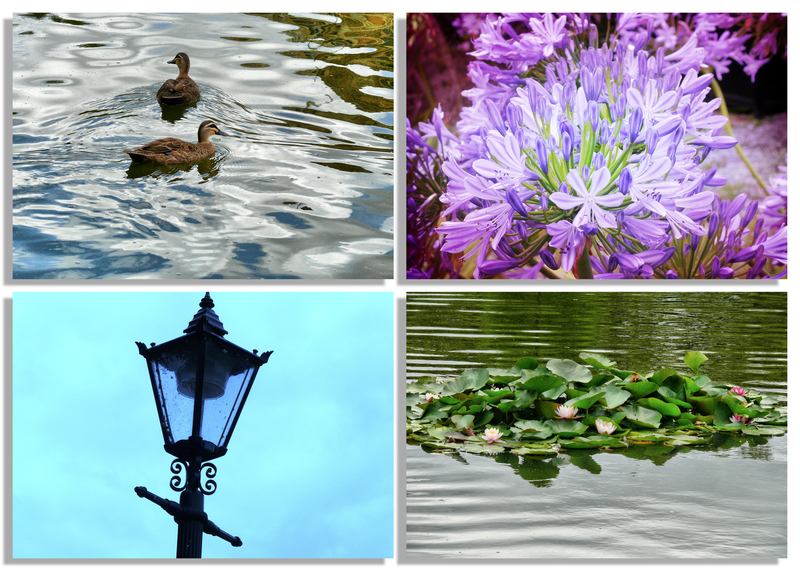 The agapanthas and water lilies, my favourite lamp post and the ducks, the ducks. Gloriously chilled and unconcerned that it is Christmas. I noticed a curious thing at the park. A number of people who’d come down with me in the lift had actually ended up at the park – drinking coffee, eating sandwiches, closing their eyes and breathing in air unsullied by the 2 for 1 special 15 minute offers being announced at K-Mart. Looks like I wasn’t the only one who knew the best place to go to hold onto their Zen. Or get it back. 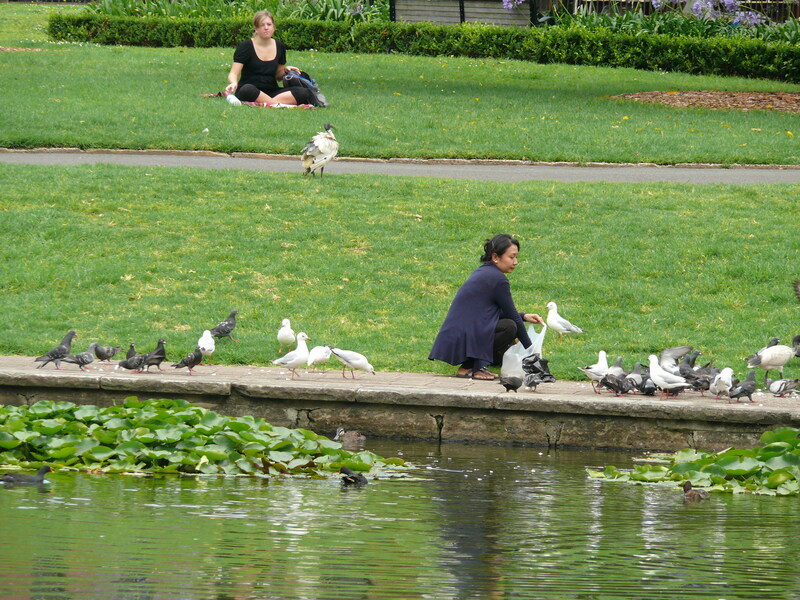 This woman, laden down with shopping bags, placed her bags on the grass and began to feed the birds. Her mouth went from a thin line to a smile within seconds. All those who watched her began to smile too. See it, feel it, breath it in. The everyday world still goes on even as we dodge the flare of christmas lights and swallow down yet another mince pie. Maybe that’s the secret to banishing the Christmas grumps – getting some grass under your feet, looking at the sky and listening to birds peck about for crumbs. 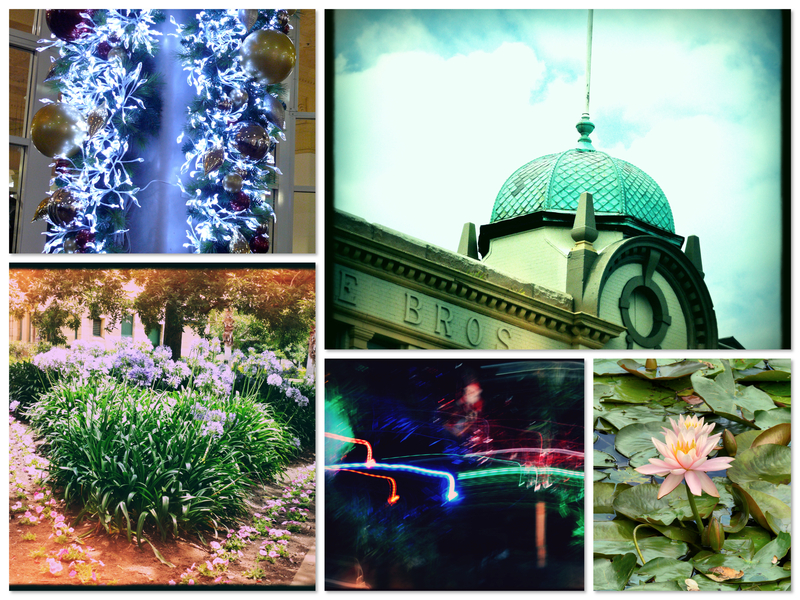 Flowers, birds and water; keeping the jolly in the festive season. The beach at Christmas is so calming although I do know that a lot of Sydneysiders flock to Bondi on Christmas day and it can be quite crazy. It is nice to hear the waves lapping on the shore, however! Looks like a superb alternative to pushy shopping. Thanks for spreading sunshine Selma. And thank you too. You really do make a difference! Lovely photos 🙂 People do get grumpy at Christmas (I just watched The Grumpy Guide to Christmas the other night – hahaha – makes me wonder why some people bother). We are going all casual this year – sick of getting stressed on the actual day – and going to go low key – so low key we will all be asleep by afternoon time 🙂 I am glad you are feeling a bit zen Selma. Have a good one. I love parks. I think they are so necessary in urban areas, Mags. Keep us all sane! Jeez, I should think that when you liive somewhere that is uptopia like weather wise, there wouldn’t be that grump. Guess it’s the same the world over. I have noticed it too though, people seem ANGRY all the time lately. There are a few food items I need to get on Saturday, but I’ll be heading out at 530 or 600 am! Gotta love 24 hour Walmarts that are also super centers and have groceries!!! Have a wonderful Christmas Selma and keep that zen thing going! You are so right, Cathy, people DO seem angry all the time. I don’t know what’s going on. I have been known to do the grocery shopping at midnight. It’s quite a good time to do it if you don’t mind all the stoners queuing up to buy their microwaveable snacks! We do, Adee. Getting grounded again is something that would do all of us good. Everyone should sit under the trees from time to time! You’ve got the right idea, Selma – a bit of communing with Nature is the way to go – we’re going to do exactly thay and head out of town to escape the whole mad, crazy consumerist crush. If only I’d been more organised, Bluebee, I would have submitted something to ‘The Necklace’ project. It is right up my street. Thanks so much for thinking of me! seriously so many things came to mind and awakened while reading and the beautiful pictures are so great to see. i always wonder when i am going to get it together to keep the clear mind no matter, thats a challenge isnt it? but the thing about zen where one must observe and remain clear is a discipline i think for someone with a lot of heart, who becomes open to circumstances in a zenlike way. People are so rude on the roads, Tipota. It is getting worse and worse in Sydney. It’s almost as if as soon as they get behind the wheel they lose their minds. Common courtesy just disappears. The clear-mindedness of zen is definitely a challenge with all the external influences we have, particularly in big cities. There is actually a Buddhist temple about two streets away from me and I don’t know how the monks achieve the states they need in such a noisy environment. They can obviously shut everything else out. I need to practise that! Your photos are beautiful … and how wonderful to have a park close by to recover from the Christmas madness of others … I just don’t understand all the grumpiness either … I wish people would just relax and enjoy all that’s good about this time of year. It’s alarming how grumpy people are. I think we are all overstretched and overstressed. Everyone needs to chillax. Hope you had a great christmas, Tracey!! After the manic shop-a-thon of the days before Christmas, I can’t believe the ladies in my life have hit the shops again today! Still, gives me tine to check out my new Kindle! Hope you had a FAB Christmas, Keith. How’s your new Kindle going? I’m thinking about getting one too. I downloaded the Kindle App for my Mac and it’s good but because I’ve got a desktop it still means I’m sitting at a desk reading a book. Something that is portable would be better. I’d love to know what you think of it!